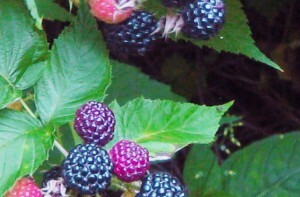 A few days ago, my sharp-eyed sister Cassie (award-winning Biologist and painter) spotted a patch of blackberry bushes growing wild in our neighbourhood. Â They seem unnoticed, and untouched by even the birds and squirrels (seems strange of the squirrels to ignore such tempting ripe fruit and instead eat all of the seeds in our birdfeeders, but they do). Â Gleaming like jewels, untouched by pesticides and bursting with sweet-tartness, they’re too tempting. Despite scratches fromÂ theÂ brambles and bites from theÂ mosquitoes, I went up with my basket and picked 2-3 quarts last night. Â And tonight I experimented a little and made a tart that turned out (if I say so myself) beautifully. Roll out pastry to about 10′ x 10′ (if store-bought, thaw 2 hours). Â Prick pastry with a fork. Pre-heat oven to 400 F; place pastry on a baking sheet, and bake for 10 minutes. 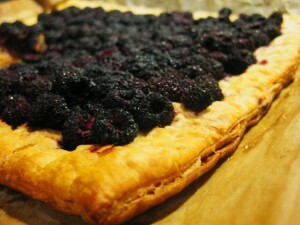 Remove pastry from the overn; reduce heat to 350 F.
Spread blackberries acrossÂ theÂ pastry surface. Sprinkle 2-3 tablespoons of sugar over the blackberries. Return to oven; cook 40-50 minutes. Let cool 5 minutes, and enjoy! I love wild blackberries, and I love fruit tarts. This is beautiful.